Marseille. La Bonne mre. Brume du matin. Galerie Bernheim-Jeune, Paris (circa 1913). M. Norero, Paris; sale, Htel Drouot, 14 February 1927, lot 94. Georges Bernheim, Paris (circa 1934). Hirschl & Adler Galleries, New York. Acquired from the above by the late owner in 1957. Paris, Galerie Bernheim-Jeune, "Les ponts de Paris" nouvelle srie d'aquarelles de Paul Signac, January-February 1911, no. 79. Dusseldorf, Galerie Alfred Flechtheim, Paul Signac, 1913, no. 12. New York, The Armory of the 69th Regiment; Chicago, The Art Institute, and Boston, Copley Hall, International Exhibition of Modern Art, February-May 1913, p. 35, no. 395. Paris, Galerie Bernheim-Jeune, Exposition Paul Signac, May 1930, no. 32 (illustrated, as Brume du Matin. Bonne Mre, Marseille). Paris, Petit Palais, Paul Signac, February-March 1934, no. 25, (as Marseille par temps de brume). Utica, Munson-Williams-Proctor Institute, Armory Show--50th Anniversary Exhibition, February-March 1963. By 1907, Signac had loosened his brushwork, freeing himself from the strict confines of Seurat's and his own pointillist theories. The year the present work was painted, each brushstroke had been broadened to create small rectangles, each regularly divided by the light color of the ground, thus emphasizing the specific hues. The artist had also increased his interest in nature, evidenced by the Claudian nature of the composition. 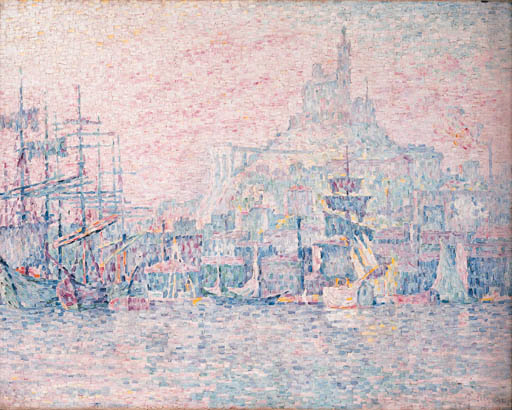 Marseille, the "Gateway to the Orient," inspired Signac to paint several views of the port. These further increased his reputation and resulted in a commission by the art critic Gustave Geffroy for the Gobelins factory, a project which was never realized.